Congressman Devin Nunes (R, Calif.) is pushing back on a weekend report from the New York Times which said the FBI opened a counterintelligence investigation into President Donald Trump shortly after he fired James Comey as the bureau's director to determine if Trump was working as a foreign agent for Russia, perhaps even unwittingly. "This is yet more evidence that FBI leaders actually had no real evidence against the Trump team," Nunes said in a statement obtained by the Washington Examiner. "Instead, they were simply trying to undermine a president they didn't like and avenge Comey's firing. By relying on the Steele dossier—a fraudulent document funded by Democrats and based on Russia sources—FBI leaders were either complicit or too oblivious to notice they were being used in a disinformation operation by the Democratic Party and Russian operatives." 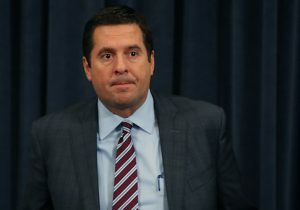 Nunes is the ranking member in the House Intelligence Committee now that Democrats hold the majority in the November elections. Prior to that, Nunes had been one of the lead surrogates for the president pressing back on the narrative of the Russia investigation when he was chair of that committee. The Times report published late Friday said in the wake of Comey's firing, "law enforcement officials became so concerned by the president's behavior that they began investigating whether he had been working on behalf of Russia against American interests, according to former law enforcement officials and others familiar with the investigation." Secretary of State Mike Pompeo also dismissed the story when asked about it Sunday. "I'm not going to comment on New York Times stories, but I'll certainly say this: the—the notion that President Trump is a threat to American national security is absolutely ludicrous," Pompeo told CBS's Margaret Brennan on "Face the Nation." "Just to clarify, since you were CIA director, did you have any idea that this investigation was happening?" Brennan asked in a follow up. "I've answered this question repeatedly, indeed on your show," Pompeo began. "The idea that's contained in the New York Times story that President Trump was a threat to American national security is silly on its face and not worthy of a response," he concluded. Like Pompeo, Republican Senator Lindsey Graham (S.C.) cast doubt on the New York Times report, and said he would investigate. "I, for one, don't trust what I read in the New York Times," he said on Fox News Sunday. "Having said all that, I'm going to ask the FBI director was there a counterintelligence investigation opened up regarding the president as being a potential agent of the Russians," he added. "I find it astonishing, and to me it tells me a lot about the people running the FBI, [former Deputy Director Andrew] McCabe and that crowd."